Mobile photo editing is now more popular than ever. That is simply because of the huge improvements made to the smartphone cameras. You’ve probably found yourself in a moment when you don’t like the images you’ve captured even after a dozen of times. Capturing a great picture often requires outstanding camera specifications, but that doesn’t mean if your smartphone isn’t powerful as the iPhone X you can’t take good picture. That is why photo editing apps were invented. Our team has gathered a list of the best photo editing apps for android that do much more than just adding simple effects such as sepia and grayscale. Please keep in mind that this list isn’t in an order in which app is the most powerful one. It is a collection of the best photo editor apps for android and you should chose the one that suits you the best. With a simple user-interface, Adobe Photoshop Express is an excellent photo editor for quick, powerful and easy editing on your smartphone. It comes with essential features such as rotate, straighten, crop and flip images. This app contains one-touch filters, frames, a huge choice of effects, auto fix and also some advanced tools such as Image Rendering Engine in order to handle larger files like panoramic photos. Its Noise Reduction option can minimize unwanted grain and speckling in night photos. This app goes in the list in the free apps and is ad-free. In addition, it provides you the options to share your photos directly to Facebook, Twitter and other social networking sites. If you are one of those people who take a lot of selfies, then AirBrush is the app you are looking for. It is very practical in quick fixes and edits made to face and skin in which are included; teeth whitening, blemish remover, an option to make your eyes look brighter and reshaping tools. Keep in mind that it’s not as good as its rating, but it’s still above average. Most of the tools are one-touch which makes all of it easy to use as well. This is one of the easier photo editor apps to use. You can get the app for free, or you can buy the pro version for $1.99 which is also relatively less expensive that most other apps. PhotoDirector is surly one of the best photo editing apps for android and with good reasons. It comes with a very minimalist interface brimming with enhancement and editing tools such as light effects, filters and many other add-ons to bring new life into the pictures captured by users. The app contains a wide array of photo editor options, and an especially noteworthy one is the app’s object removal option, which deletes unwanted objects from photo really quick and in a very fine way. Also there is another area too where PhotoDirector really shines and that is, its camera tool. The camera in the app offers huge options of filters whose intensity can be adapted in real time, aside from face detection and gesture support for capturing photos in many aspect ratios. Snapseed is a very powerful Android image editing app that comes with a lot of features. The best part is that this app is free and is also ad-free. The app has a user-friendly interface which makes it very easy to use, just touch the screen and open any file you like. Snapseed carries a lot of different types of filters to modify the look of the picture including 28 different varieties of tools. Once you are done editing your photo, you can easily share on any social networks or export the file to save it. With 50 million downloads worldwide, Pixlr belongs on the list of the best photo editing apps for android. It comes with all the tools that a user might need. One of the first thing you will notice when you start using this app is how well the tools are organized into just 5 categories on the editing home page. This great arrangement is what makes this app an absolute joy to use and edit our images with a huge array of effects and styling elements. It contains over 2 million combinations of free filters, overlays and effects. 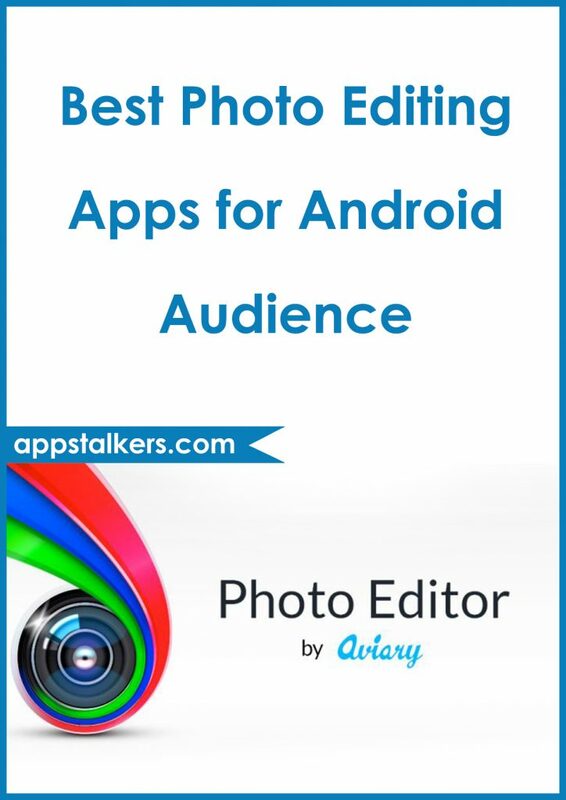 However, there are other factors that make this app a serious candidate for the best image editing app for Android. Take for instance the app’s favorite option, which allows users to save their preferred combinations of filters and overlays for future use and also it provides you the service to share the edited images directly on social media networks like Facebook, Instagram and Twitter. In addition it has Auto Fix option and the ability to stylize photo with pencil, drawings and ink sketches. This app is free to download but it contains ads and it comes with in-app purchases. Next on the list of best photo editing apps for android is Photo Lab. Photo Lab takes a place on this list for many reasons. It has a collection of over 700 different effects like stylish photo filters, collages for multiple photos, creative artistic effects and lots more. With a simple and user-friendly interface, this editing app is very easy to use. This photo editor carries every basic tool a user might need like: crop, sharpness, rotate and even touch-up. Furthermore, you can save your edited photos to the gallery, share it easily to every social media platform or send it as a message. It is free to download but it display ads and the main drawback is that it watermarks your pictures when you use its free version. This photo editing app is arguably one of the best editor apps, and for a good reason. Thanks to the wide choice of editing tools and the clutter-free manner in which they are located on the app’s homepage, making it highly suitable for users to discover the wanted filters and tools. Now being a part of the Adobe family, along with its super user-friendly interface this app comes with everything from the basic such as filter and crop, to more advanced editing tools like sharpness, color adjustment, lighting and focus. You can download it for free with some in-app purchases. YouCam Perfect is a very handy photo editing app where you can beautify your portrait images within seconds. It comes with many tools in which are included various effects, photo crop, rotate, vignette and HDR effects. One of the best things that make this app great is that it comes also with a Face Reshaper, Body Slimmer to shrink your waist and make you look thinner instantly and Eye Bag Remover. You can download it for free with some in-app purchases for extra features and contains ads. If you’ve ever desired a no-frills app that can do just one task for instance, make your photos look magazine-worthy, and do it without editing it harshly, then this is the app you are looking for. The app’s premium tag is justified by the huge collection of really useful editing tools it brings to you. Facetune carries a lot of retouching options like skin tone smoother, reshaping tool and a many other that will help you make that perfect self-portrait which can become a nice profile image. But where this app really shines the most is the level of management it gives while implementing editing functions, as the enhancement tools are neither too hostile to make the photos look like a fake mess. You can get this app for $5.99. With over 100 million downloads this app is one of the best photo editing apps for android you can find. The main reason why PicsArt is such a stand-out is due to the huge number of options available for you to customize your images. It also comes with a built-in camera feature and a service to share the edited images directly to the social media platforms. Also it has like the most photo editor apps the standard features like collage, frames, stickers etc. You can download this app for free with some in-app purchases and also this app contains ads.